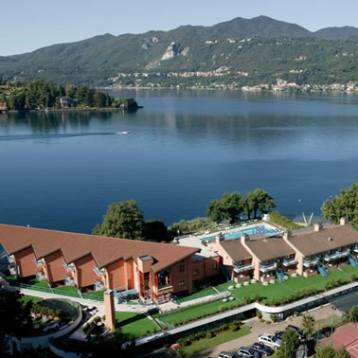 The four star Hotel Ristorante L’Approdo is in a stunning position set in an oasis of peace and tranquillity overlooking the waters of Lake Orta and the hill where the UNESCO world heritage site, Sacro Monte, is located. Ideal for both business and leisure stays, the hotel is just a few minutes from the picturesque medieval village of Orta and the Island of San Giulio, an opportunity for enchanting sightseeing, easily reached from the hotel both by car and by public boat or water taxi. The warm welcome, smiling professional service and friendly helpfulness of the staff at the Hotel L’Approdo will be a byword during your relaxing, peaceful stay here.